I trained for 6 months prior to the challenge, swimming 3-5 times a week. 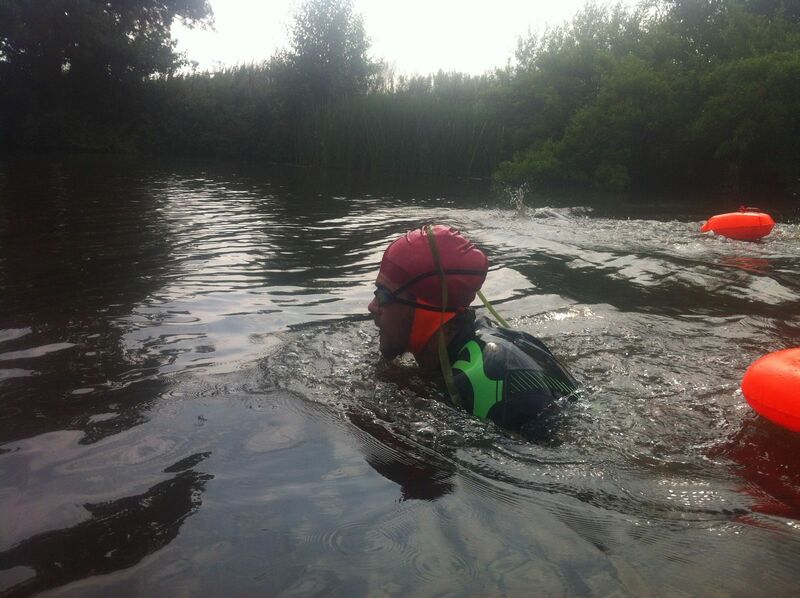 Arguably, 6 months might not have been enough time to train for such a long swim, but I had already settled for the 13th August 2016, as by doing a quick internet search, google told me that on average, this was the warmest time of the year. I spent the next 6 months preparing as much as I could in between my job. Swimming became my life. And from here on in, Kevin would give me one ‘fix’ each week to work on. 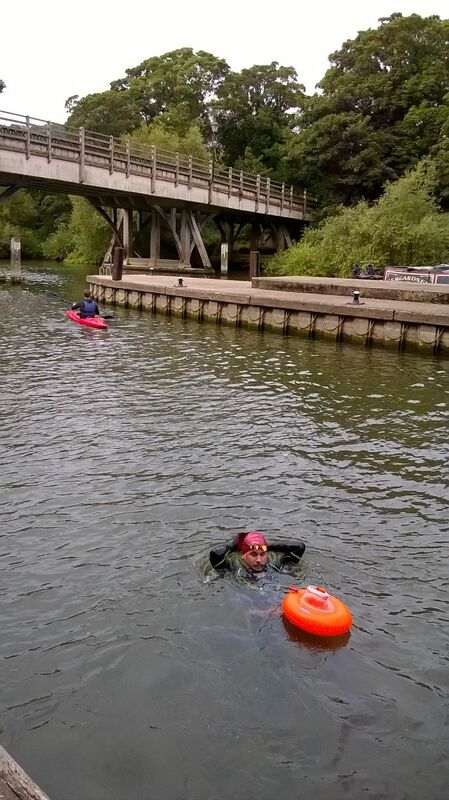 And gradually my stroke went from an uncoordinated splash to a more efficient and relaxed stroke. 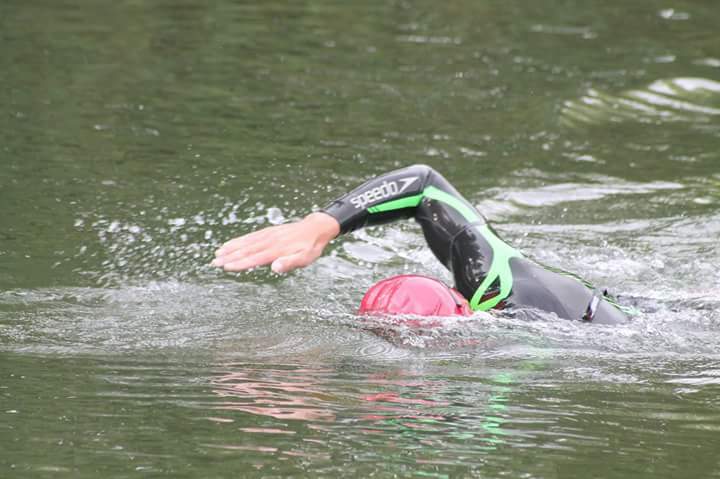 It took about 2 months of training 4-5 times a week before I felt like I could actually swim front crawl properly. After swimming in the pool through winter, I somehow made friends with a lady named Cheryl. We had gotten in at the same time and got out at the same time after 1hr15min practice swim, and we asked what the other was training for. 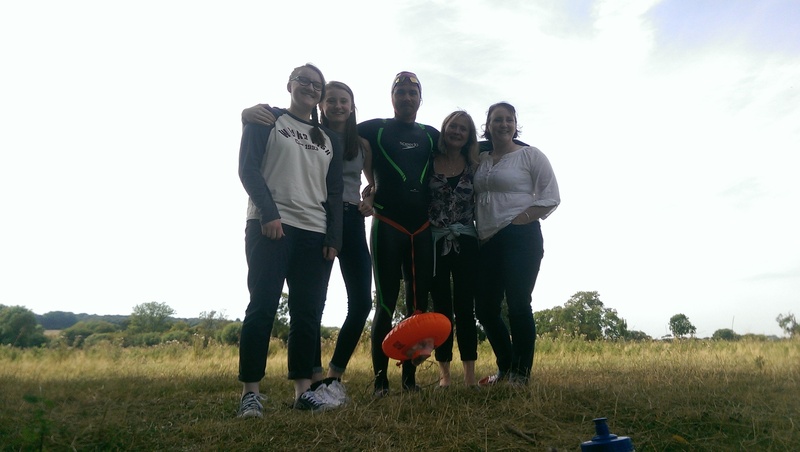 Cheryl was training for a relay channel swim, with her ladies – the dover divas. We exchanged numbers and started to train with each other once a week. I’ve got to say, this random meeting helped so much. 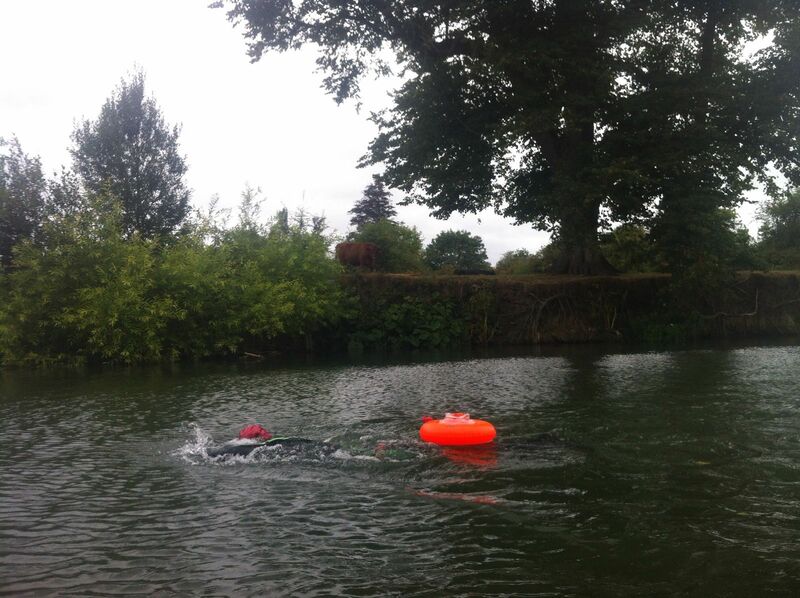 Cheryl was an extremely experienced open water swimmer, and the advice that she gave me over the next 4 – 5 months of training was indispensable, thank you Cheryl. So after 2-3 months training in the pool, I was getting concerned I needed to be training outside, to get used to the water temperature, and used to swimming in a body of water larger than 25m. There were not many lakes in the area and the ones that were around were fishing lakes, private or too far away to cycle to (I don’t have a car). Cheryl actually suggested getting in touch with Paul who managed the local fishing lakes. So I gave him a call, half expecting his reaction to go along the lines of ‘We can’t possible let you swim in our lake because of insurance etc etc. Are you crazy! ?’ So when he instantly said ‘Sure, we’ve got a little stock lake that we don’t use for fishing’ I felt like the stars had aligned. From here on I would train outdoors for the majority of the time, doing one pool session a week to work on technique. It was a small, 200m long crescent moon shaped clay-ey bottomed lake, and although you came out a dark shade of brown, it was perfect and in a beautiful location. It also worked out perfectly to train with Cheryl, as her house was about a 2minute walk down the road (which also meant I could go in for a cup of tea, or a beer afterwards)! 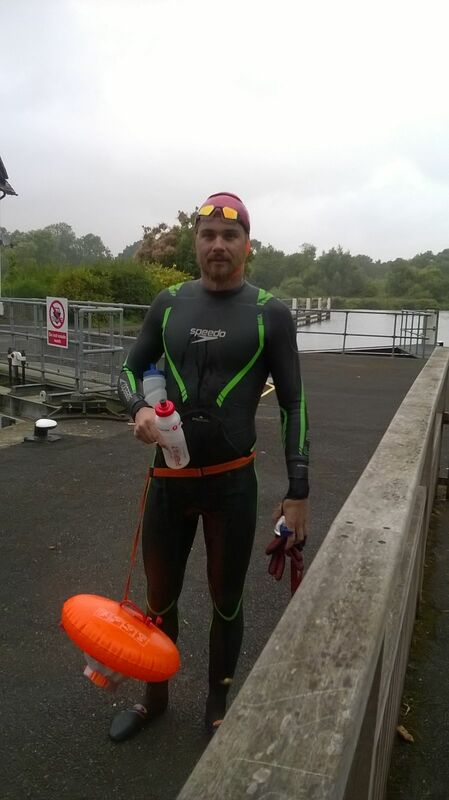 Longest training swim – 2 hours in the pool and 3.5 in the lake. This is Cheryl’s dog, trying to eat my snacks! It was always nice to unwind at the lake for an hour or so after work, especially on days like these. I struggled with injury throughout the 6 months. Generally minor shoulder pain here and there, and one occasion where I slept funny and my shoulder was in agony for a week. This was playing on my mind a lot, and I was worried injury may force me to stop training and abandon the swim altogether. To help this I went to see a swimming coach called Jason Tait who runs South West Swim in Swindon who filmed me swimming in his endless pool. He tweaked my stroke to make me more efficient and minimise shoulder pain, which helped hugely. I also started swimming every other day to minimise shoulder pain, swimming 4 times a week rather than 5. Session with Jason Tait in his endless pool. It was eye opening to see you stroke in slow motion at all different angles. But even though I felt relatively prepared after the 6 months, I was also completely unsure whether I could complete it. The shoulder injuries were still on my mind, and I was worried how they and the rest of my body would hold up when swimming 6-7hrs a day for 2 weeks. I was worried about the cold water and I was worried about getting ill from all the sewage. All in all I don’t think I had ever felt more unsure about taking a challenge on. But, this was the reason why I was doing it, as a challenge and to see if I could make it. I had a small team supporting me. 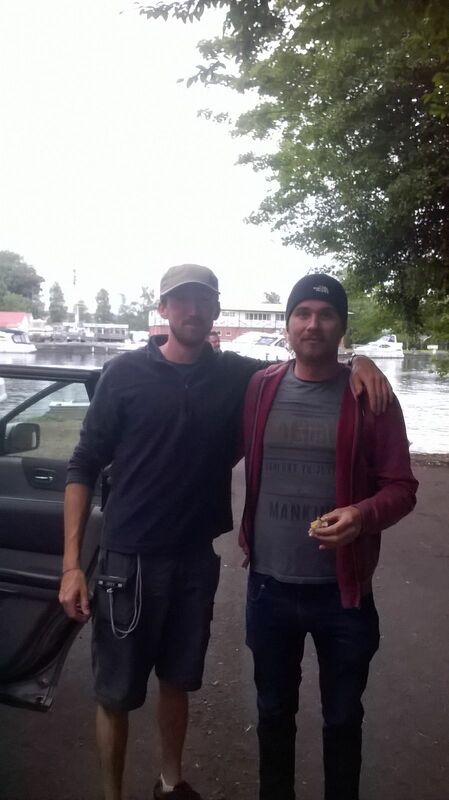 My friend Josh kayaked alongside me, making sure I was safe and fed and my Dad was the ‘logistics manager’ and would take us to and from the campsite to the river each day. 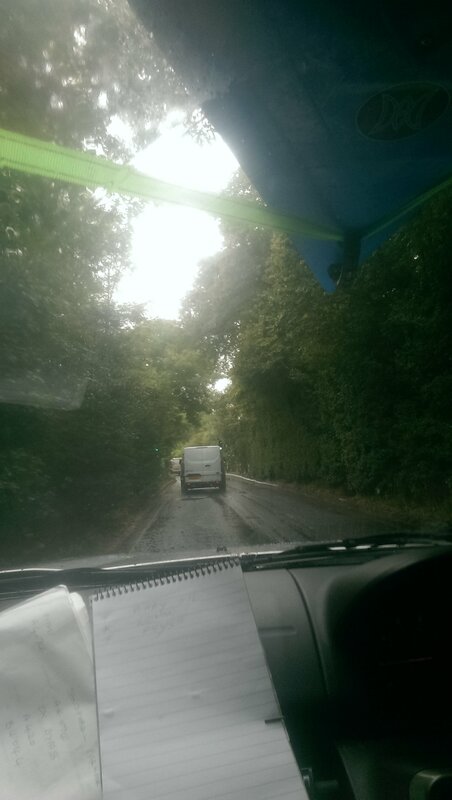 We all stayed in a caravan that was kindly lent to us by a friend’s auntie, and slept in campsites along the way. 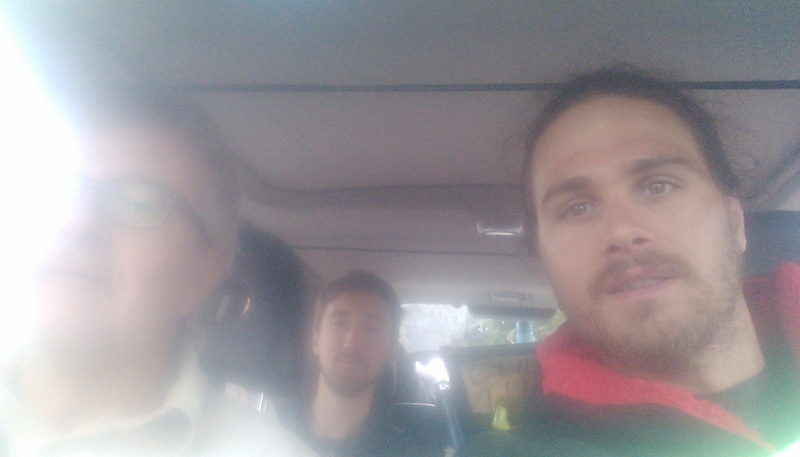 Before going into details of the trip, I need to say how thankful I am to Josh and my Dad, I simply wouldn’t have been able to complete the challenge without them. They kept me going, constantly encouraged me, were always positive, were great to be around, never moaned, and always went out of their way to help me complete the challenge. 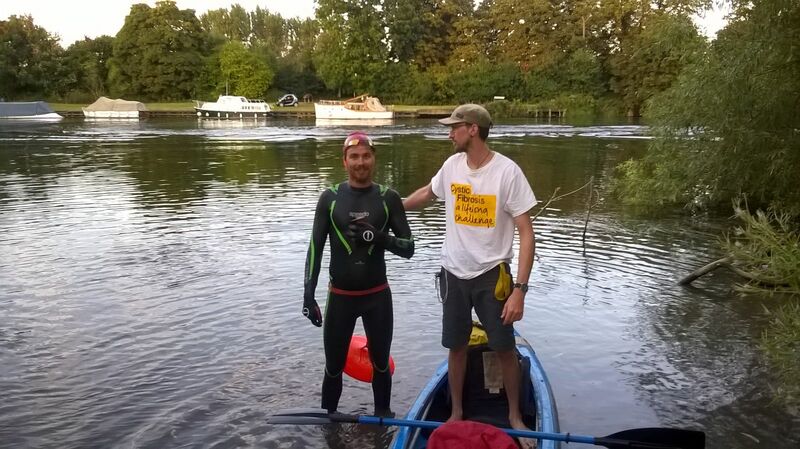 Whilst I’m on the subject of thanking people, huge thanks to everyone who came out to see me, swim with me, kayak with me and to all the people who donated, on the riverside and online. Before the swim I had tried my best to get everything sorted, but there were a few loose ends in terms of planning and logistics. 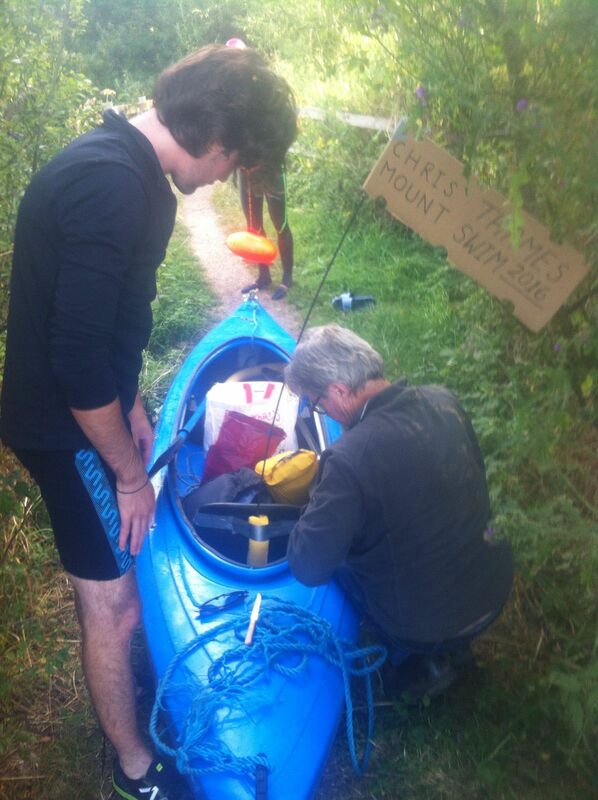 I had the main things sorted, the route, the kit, the campsites, the food. However, everything that could have gone wrong somehow went right. Like the bent electrical hookup on my Dad’s tow rod, the broken fan belt, having no roof rack for the kayaks, the brakes on my Dad’s car breaking, and the chance of getting injured, ill and cold. 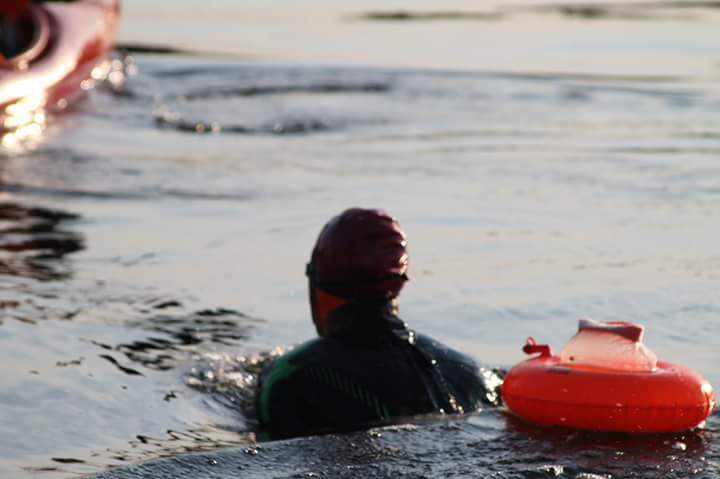 All of these things we either managed to fix or they didn’t happen, and although I managed to complete the swim, before I started I didn’t think I had it in me, I had never been so anxious about doing something before. My shoulders held up, sure they were sore, but they held up fine. I didn’t get properly ill, be it the measures we went to to avoid it, or just a stroke of luck. And the water was ridiculously warm, I’d say around 18-20 degrees, so I got lucky. This mechanic (and his friend who I didn’t get a photo of) were amazing. And they fixed the car as well. And the other guy just happened to have the right sized fan belt. 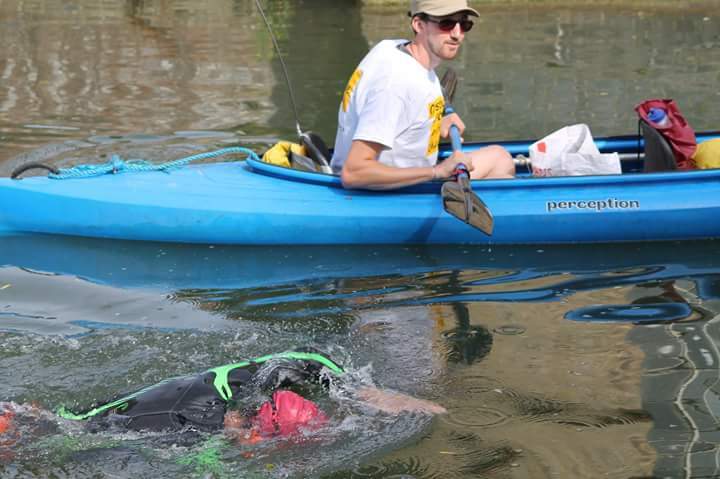 The swim was a physical and emotional ride, there were times where I would feel like I was struggling through thick treacle, mentally battling through downward spirals of exhaustion, but there were also blissful moments where if felt like I was effortlessly gliding through the water, feeling like I could swim forever. These darker and higher moments were few and far between though, and generally I and just got to it, putting one arm in front of the other. 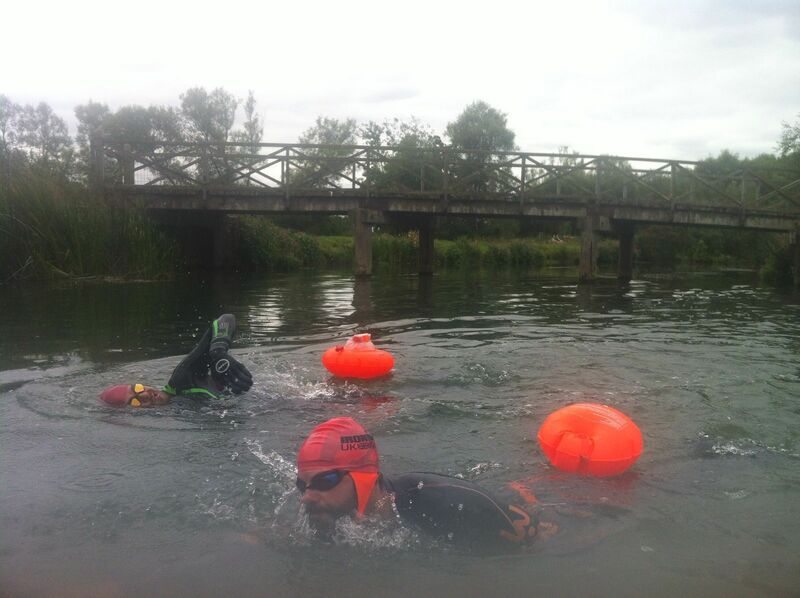 We purposely started the swim with shorter distances. 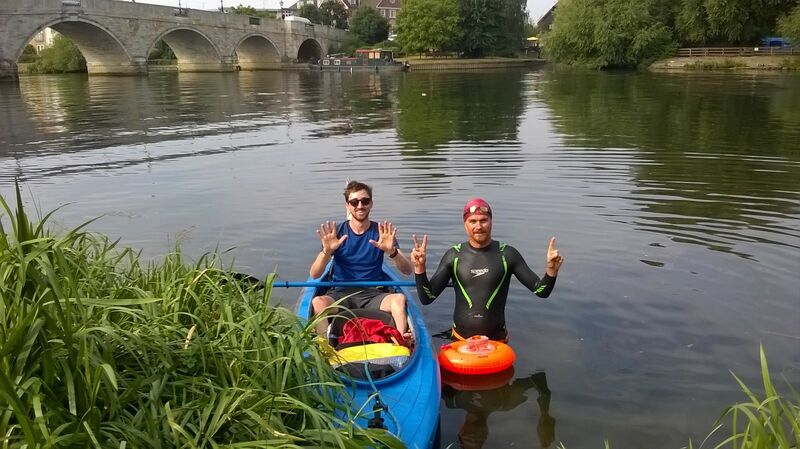 Day 1 was 8.5km, Day 2 was 10km and the rest of the days were planned to be 17km. 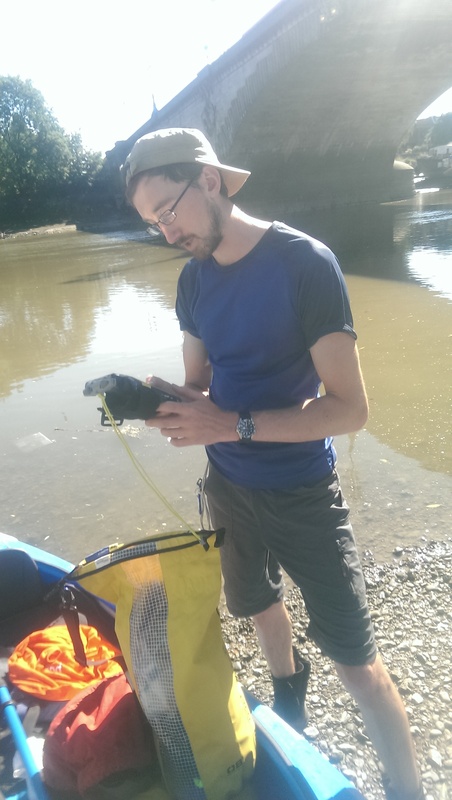 We took each day as it came, and adjusted the distances depending on how I was feeling and where we could actually get the car down to the river. So during the day, my dad would often be driving to the location, and reporting to Josh where we could actually meet. 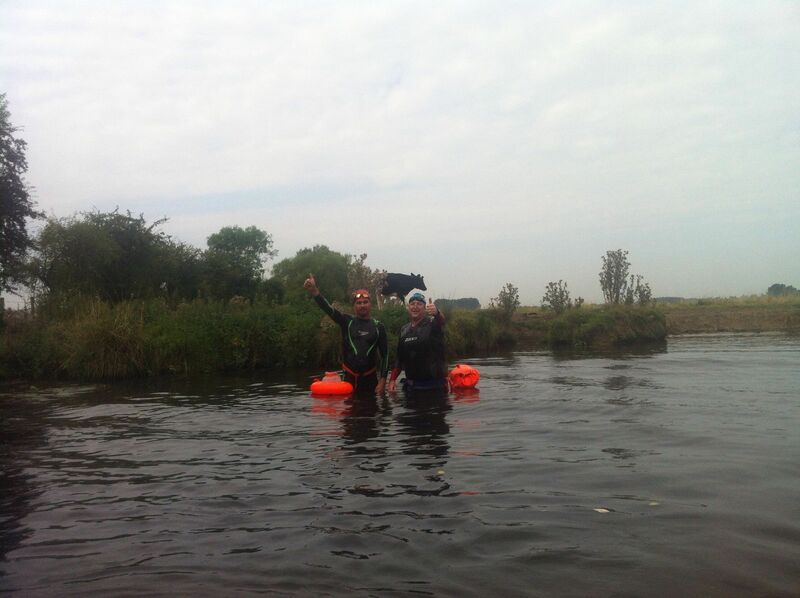 We would aim to start at 9:30am and usually finished around 18:00, swimming for around 6 hours of that time. …I wasn’t feeling right for the second portion of the day, feeling bit sickly. I thought the illness feeling was just a sign of physical exhaustion. After finishing the day I couldn’t get anything down, which is unlike me. 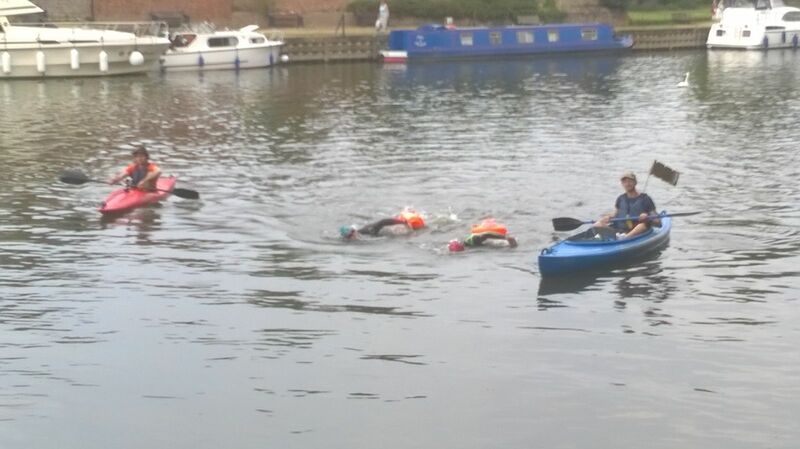 And, also I wasn’t able to really eat much on the last hour of the swim. Finishing Day 06 was such a relief. This was the toughest day physically and mentally by far. 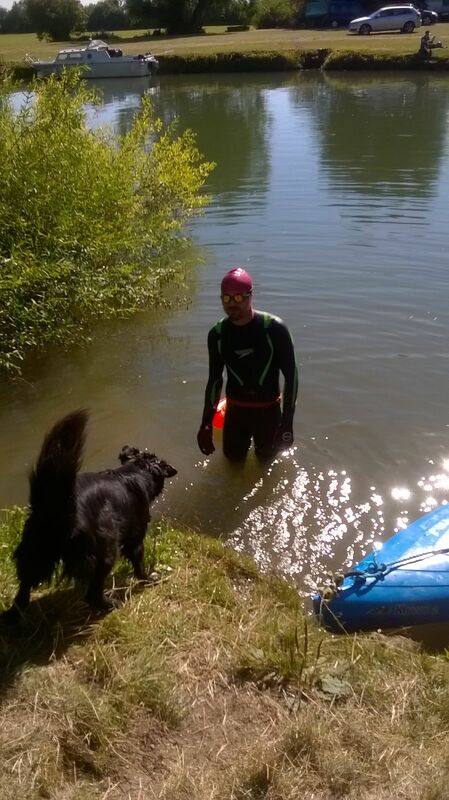 The guy behind me, Dave, slowed his pace and swam with me the whole day. Without him there I am not sure I could have done it. Thank you Dave. Each day I would drift off into my own little world. A world empty of sound, other than splashing water. A world where you barely speak to anyone, let along speak, whistle or hum to yourself. A world where 60% of the time your eyes lose focus as they gaze off into translucent lagoon-jade of the river all around you. It was an isolated world, where I would go into an almost meditative trance – stroke, stroke, stroke – breath – stroke, stroke, stroke – breath. People often asked what I thought about, and in all honesty, not a lot. I would sometimes think about what I could tell people I was thinking about. Once I was in my rhythm, I was focusing on my stroke, and my thoughts would often disappear and I would be swimming through a blank empty space. Sometimes I would pay attention to what I was seeing and with each breath, I would see fleeting glimpses of the changing surroundings, bushes and reeds, trees, endless fields, occasional birds, blues skies and a white bright sun, Josh my kayaker, beautiful houses, stone bridges, boats, people sat outside the pub, before dunking my head back into the water, doing a few more strokes and then looking the other way. Most of the time, as my mind was elsewhere, I wouldn’t really notice anything going on around me. 3. He passed me water, which I swilled around in my mouth before spitting out. 4. Then I started eating and drinking. Many people offered their tips on preventing illness. Some of the tips did seem a bit odd, but I followed all of them, any edge I had over getting sick I would take it. Other measures included: drinking a swig of potion before and after swimming, drinking a can of coke after swimming (everyone I spoke to told me this – goes to show whats in the stuff), avoiding fruits and vegetables from the deadly nightshade family (to reduce the chance of inflammation) and putting sudacrem on all blemishes and cuts in the hope they wouldn’t become infected. Breaks looked something like this. We tweaked what I ate slightly, but each feed would roughly consist of a couple of swigs of High5 energy drink, 300ml of water, a High5 energy gel, a banana and a Meridian nut bar. Later on in the day the nut bars would be replaced with maltloaf or banana bread. I would always have a thermos of hot soup, which was utterly amazing. I would swim for up to 6hrs 30mins, which is 12 breaks. So that’s 12 bananas, 12 nut bars, 12 energy gels which equals 4720 calories. This is just for what I was eating whilst I was swimming. Daily food intake. That’s a hell of a lot of food! We usually took 1 or 2 extra of each just in case. To make breaks quicker we pre opened the Meridian nut bars to save Josh having to fumble around with them. Casually drinking hot soup in a river! 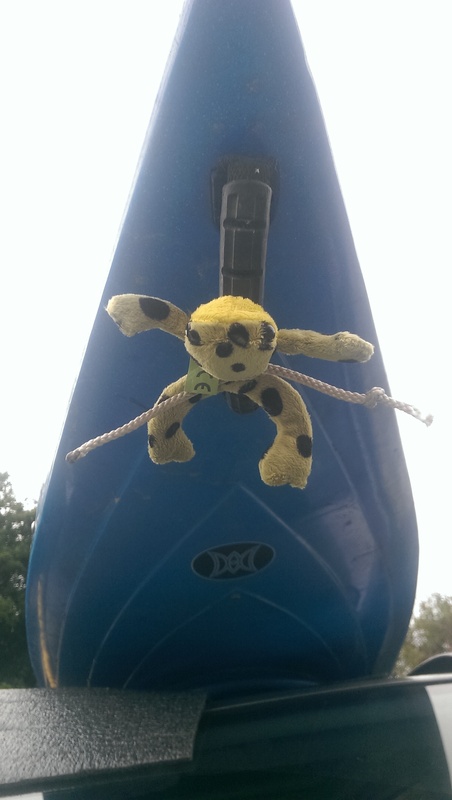 Break time on dry land for a change. To start the day I would have a bowl of porridge with nuts, seeds and nut milk and a swig of potion. Immediately after swimming I would go through the above sanitation routine, have a swig of potion, a can of coke/pepsi and then eat a hummus, avocado and spinach sandwich, some dark chocolate and nuts and maybe a banana and an apple. This would be followed by an evening meal, either cooked ourselves in the caravan or from a pub, plus a well deserved guinness. Often, I would find it hard to eat large portions in the morning and evening, I think because of the amount I was eating throughout the day. The total calorie count per day was around 6000 calories. Break time – eating a banana. Break time – having a high 5 energy gel. Meridian and High 5 were amazing on the road, and sent out more goodies as we were getting low. Did it help? I am going to say a definite yes. Even if it was giving me a little mental boost, all the stuff in it is good, albeit, fiery stuff, and I think it definitely gave me an edge. 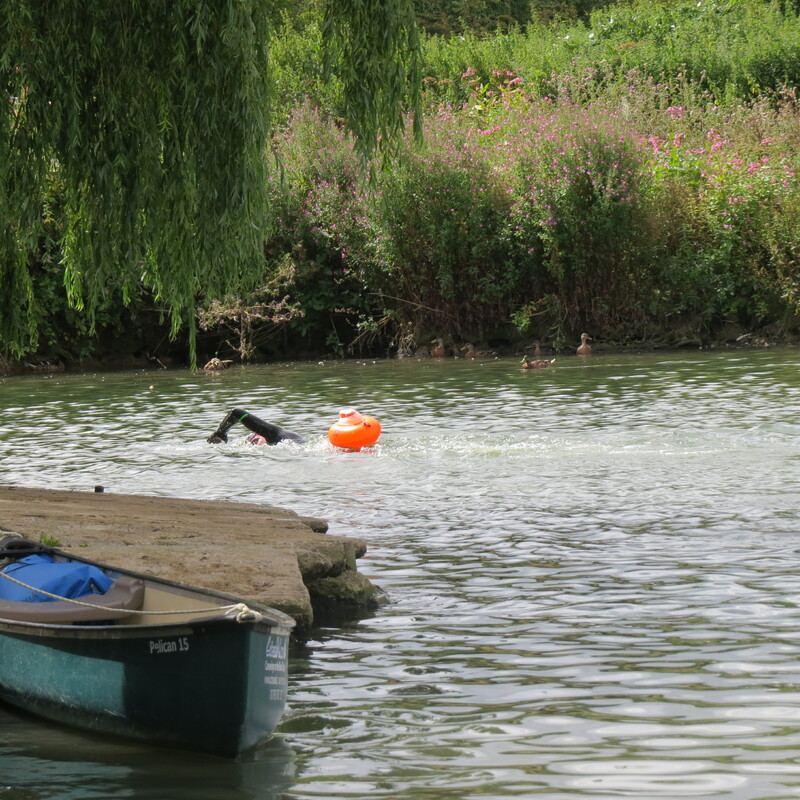 Back to swimming, although I was in my own little bubble, each day was punctuated with small chats with many people on the river banks, in between locks and in their boats. 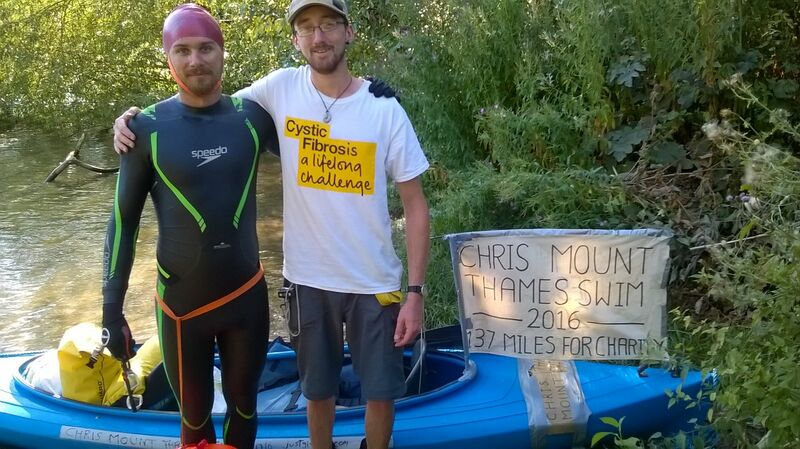 It was humbling as many expressed an interest in what was going on and donated generously – over £1200 was raised from the river! I looked forward to these little chats and breaks in the day, even if it was a nightmare trying to hear them through my ear plugs, and I often replied by shouting at them as my volume control was completely off. Sometimes I couldn’t hear the people at all, so it was slightly frustrating that I couldn’t speak to them. But Josh would be my voice and did an amazing job of telling them what was going on. More donations coming in from passers by. 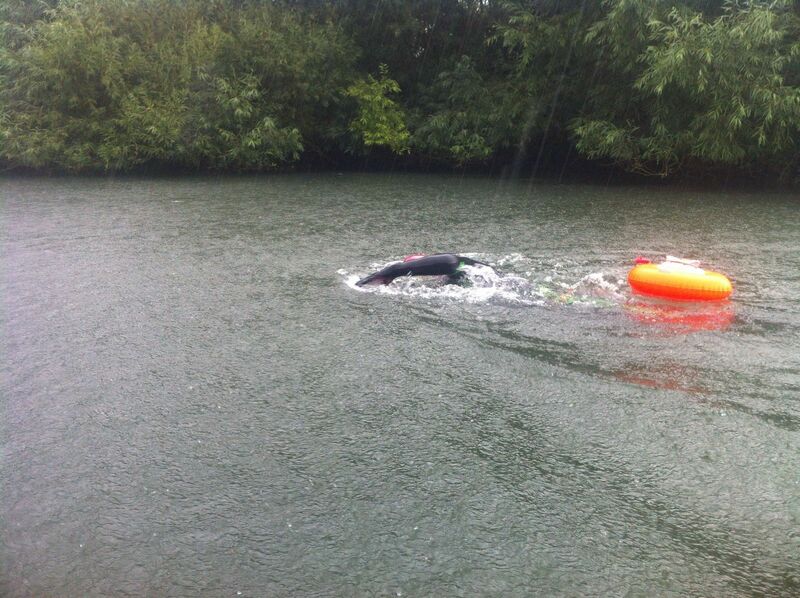 The last 2 days of the swim were a bit nerve racking to start with, for both me and Josh. After Teddington lock the river becomes tidal, so our timings had to be spot on, and the sheer power of the river was just phenomenal. 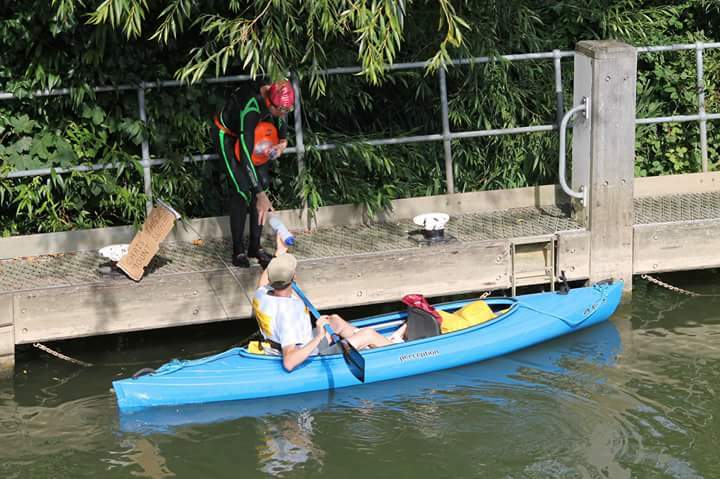 The Port of London Authority (PLA) manage the river from Teddington onwards, so we emailed them to let them know when we would be in this part of the river. They sent back probably one of the most formal and terrifying emails I have ever heard, in no uncertain terms saying we were risking our lives, and listed all the potential things that could go wrong. Which definitely scared us. You can legally swim all the way to Putney Bridge, but it seems they like to cover their backs and discourage casual swimming, as it is genuinely a dangerous part of the river to swim in. OH MY DAAYYYZ! Have you ever seen such a ridiculous forehead tan!? 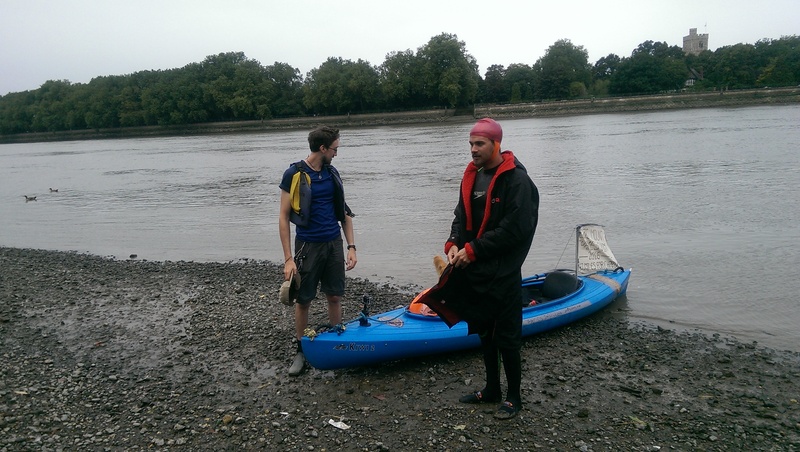 The view from Kew Bridge at low tide – where we finished on the penultimate day. 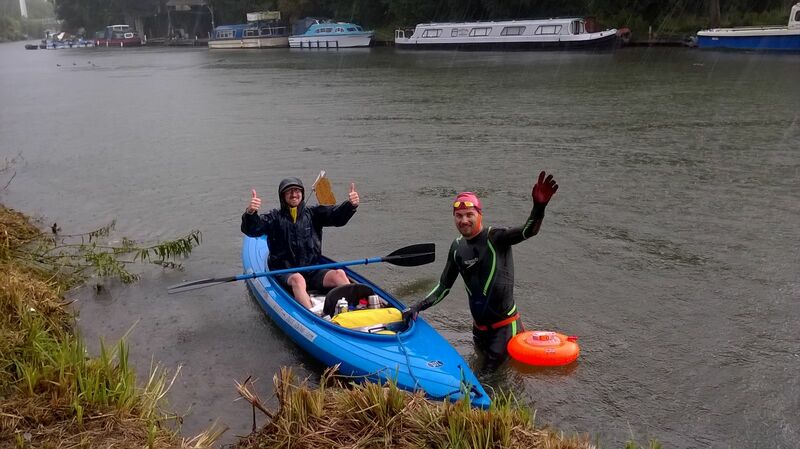 So after Richmond lock, the final lock on the Thames before the Thames barrier, you could really feel the power of the river, and I was flying, I mean I could lie on my back and float in the water and travel faster than I had been swimming the whole journey! 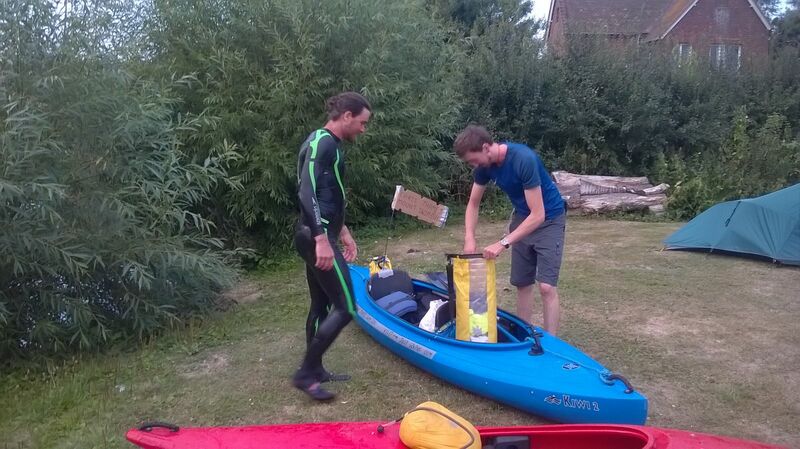 Because of this the last 2 days ended up taking half of the expected time and we flew down the river. It was a murky part of the river, and I couldn’t see anything in the water anymore, and you could see dirty water from run-off pipes flowing into the river and dark murky patches rising up into the river. I tried to put it to the back of my mind, I thought I was destined to get ill, but somehow avoided it. Dad – Josh – Me – Fay + penny the dog. Just before starting the final day. We had to wait a little longer for the tide to turn. 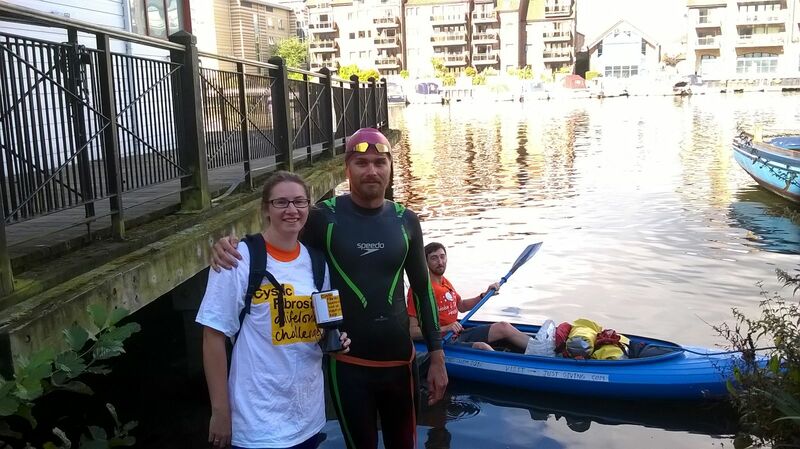 Huge thanks to Fay who walked alongside and helped to raise donations from the river side. The final day was a shorter one at 8.9km, and because of the tide it went by in a flash, only taking 2 hours swimming time. 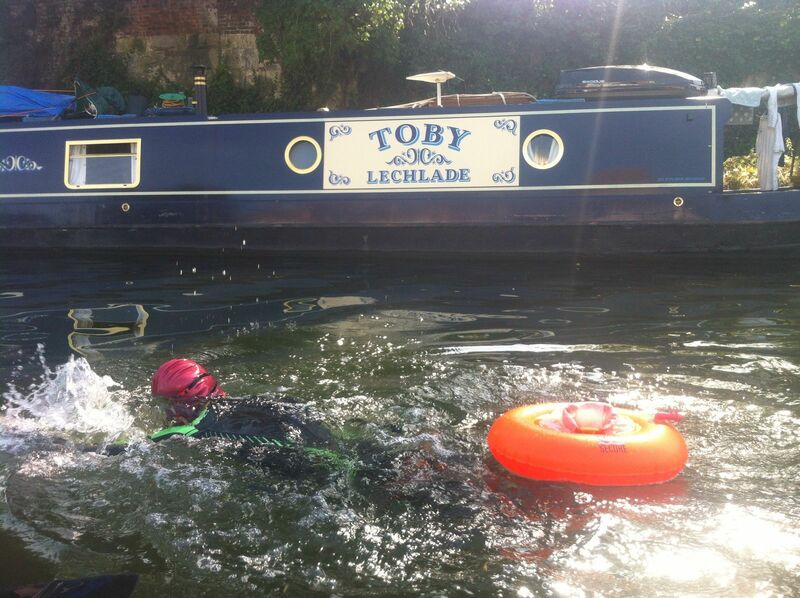 It was a fantastic feeling being this tiny little person in this huge river, swimming into London. My mum and Dad and Fay were walking alongside helping to collect donations, and for once I was actually swimming at walking speed. 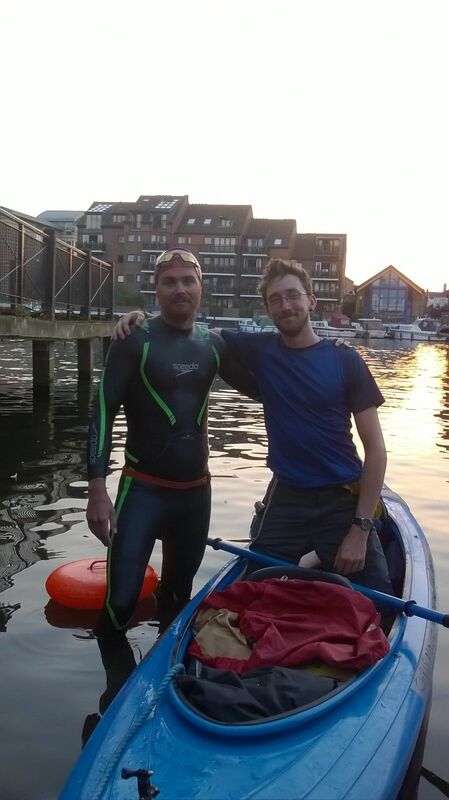 Once we had reached Putney bridge it was quite a sombre feeling, I wasn’t overswept with emotion, I just got out, and thought, I’ve done it, I have swam the Thames. I like this picture because it shows just how small me and Josh were compared to the river. By the last day the river was just huge, and insanely powerful. And the Thames is a pretty small river compared to others worldwide. Had to touch the Bridge at the end. The team. Josh – Me – My Dad. I couldn’t have done it without these guys, it was a team effort and I couldn’t have asked for a calmer, more positive, funny and inspiring couple of guys to do it with. Travelling this river from (almost) source to (almost) mouth was such an enriching trip. Experiencing glimpses of the changes in surrounding landscapes, the town and cities, and the people from river level is something I have never done before. It was strange though, because although I was in the heart of the river, in a way I felt like I didn’t see much of it, as most of what I saw was water, as that it where my head was looking most of the time. 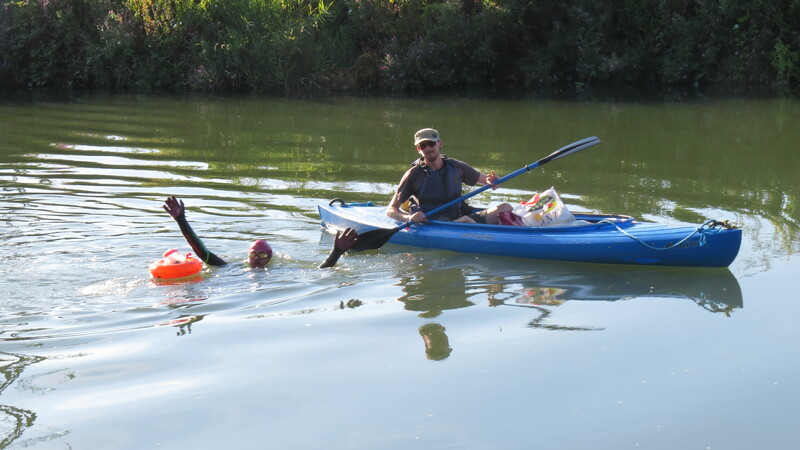 As I said, before I started the swim, the thought of swimming in the river literally petrified me, but even after a few days I felt so comfortable in the water. It goes to show that fear is often just the thought of doing something. Once, you’re in there and actually doing it, you realise it’s not so bad and you can get on with it. 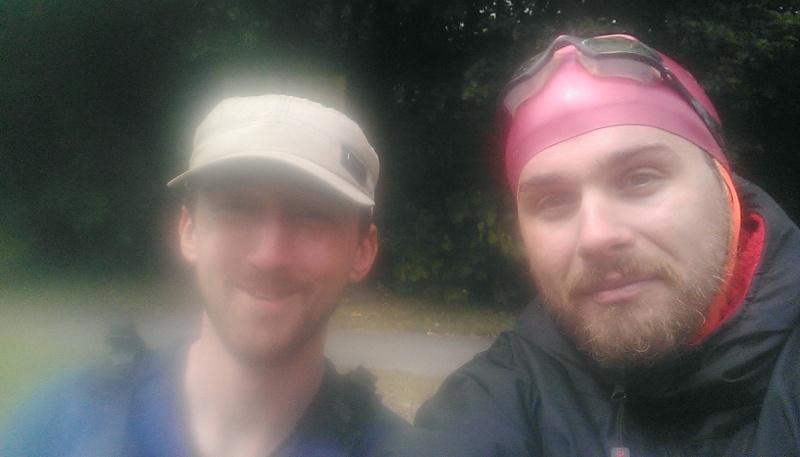 I was on a high after completing the challenge, but from experience I was prepared for a comedown in the form of the ‘adventure blues’ – feelings that often arise when returning to the ‘real world’ after doing a long trip. 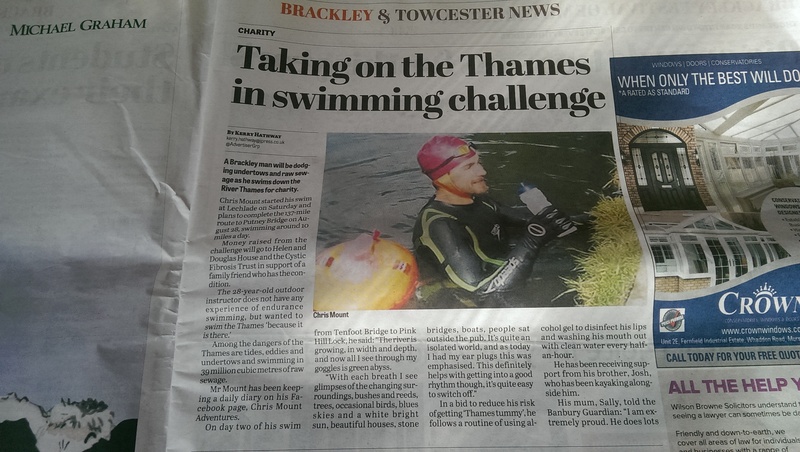 All my focus for the previous 6 months, other than work, had been on training and planning the swim. I knew this could happen, so purposely kept myself busy by seeing friends, exercising regularly, getting bits of kit returned that I didn’t use, writing thank you emails to sponsors and tying up a few loose ends. However, often once you reach the finish line of something, you and your body are done. And in a way that is how I felt. I had completed it, I had ticked another thing off the list. And I think that’s part of the reason why it has taken me almost 2 months to write this, because my mind has simply been elsewhere, thinking and doing other things and getting back into real life. 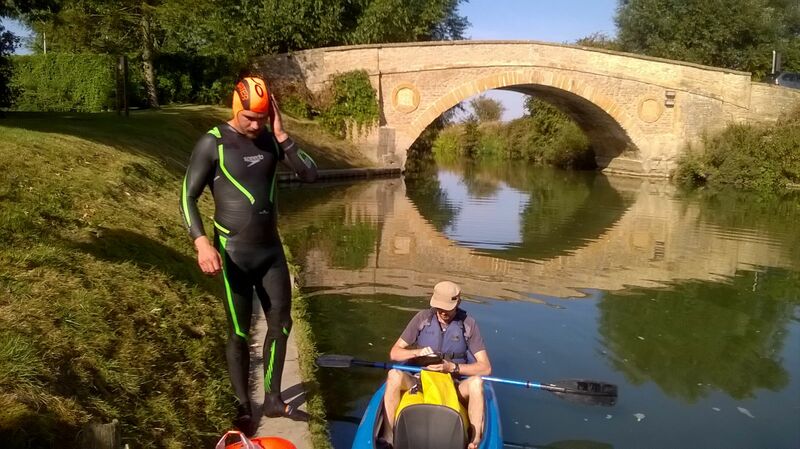 If anyone has a dream or fear to try something different, be it a long (or small) walk, jog, run, swim, cycle event or a skydive, going travelling, changing career or something else from your bucket list, then I recommend you do it. It’s not always easy, granted, and I can’t tell you how, but I know, that from doing these things myself I have had some of the most enriching experiences of my life. After all, we are around for a blink of an eye, and personally I want to get to the end of my life and think, man, you gave it a good shot, I haven’t got any regrets. Not, I wish I had tried this, I wish I had tried that. And all I decided to do was to try something that might seem a little crazy to some people. Sometimes it feels impossible to step out of the box, like society will judge you for doing these things. Many people will tell you it’s a stupid idea, that you will never make it, that you will get ill, or don’t go there that’s too dangerous etc – but they are usually wrong – most of the people saying this have never tried these things themselves. The hardest bit is deciding to do it. So first, think about what you want to do, second write it down so you don’t forget it and third, set a date for when you are going to do it. And then tell 3 people about it, and after that it is basically law that you have to go through with it. Think about emailing people who have done these things before, ask for advice, but more importantly their response is usually going to be positive. I remember umming and ahhing about the swim, and I think my second email was to a guy called Dave Cornthwaite, asking for advice. 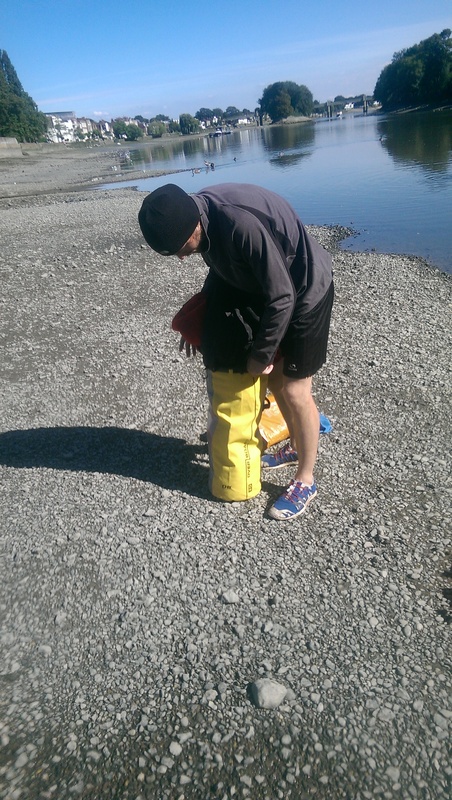 He has done numerous long distance expeditions, and swam 1000 miles down the Mississippi river. He replied on the same day saying I should definitely do it, it sounds like an epic challenge and wished me luck. At times it can get wearing when people keep telling you you’re crazy, it can make you can start to question why you’re doing it. But remember why you decided to do it, remember the emails and other positive encounters, and know what you’re doing is scary, but that is why you’re doing it and it will ultimately be one hell of a ride. Massive massive thank you to Josh and Dad, all the Dave’s and everyone else who came out to see me, to everyone who donated, be it online or from the riverside. It made a huge difference knowing that money was being raised for charity, espeicially on the physically draining days. I was also shown support from several amazing companies listed below who sponsored or discounted kit and products. For more information about the specific items of kit I used take a look in the Kit section. Meridian Foods – For all the peanut butter and nut bars a man could dream of. Speedo UK – For the wetsuit, caps and goggles. Dryrobe – For the amazing dryrobe. YB Tracking – For the use of their GPS tracking device. HIGH5 Sports Nutrition – For the energy gels, bars and large discount. Prevent Sportpain – For all the tubes of wetsuit lube by 2Toms UK. 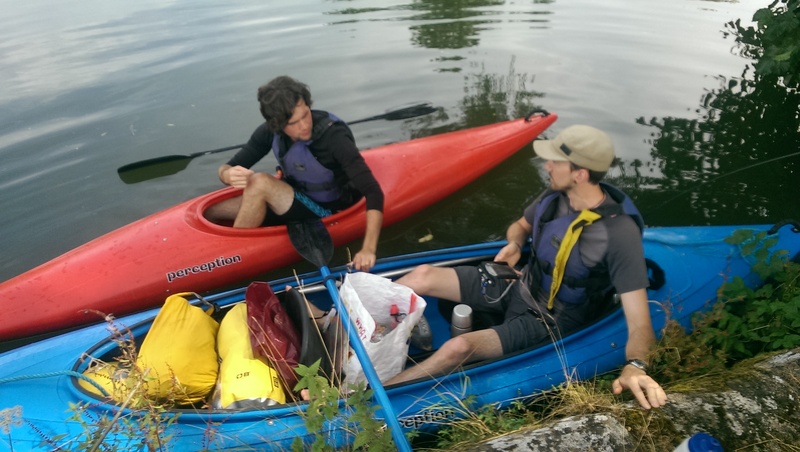 OverBoard – Waterproof Bags – For the large discount on their waterproof bags. B2B Graphics – Bicester- For the awesome car signage. 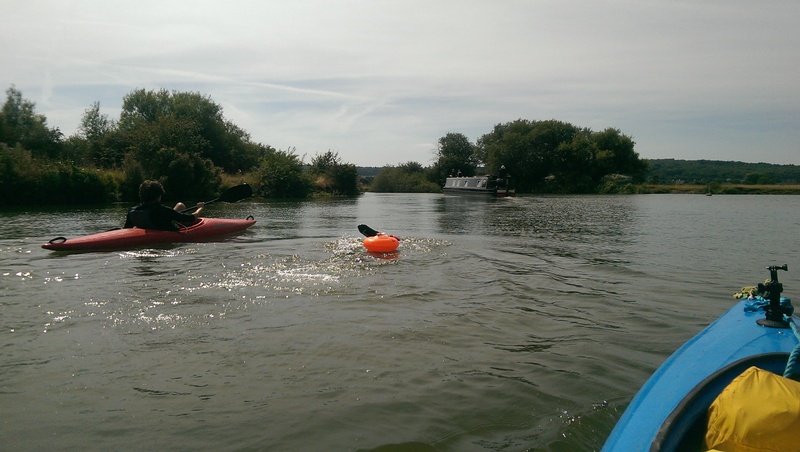 Rough Grounds Farm – Lechlade – For 3 free nights at their beautiful site. 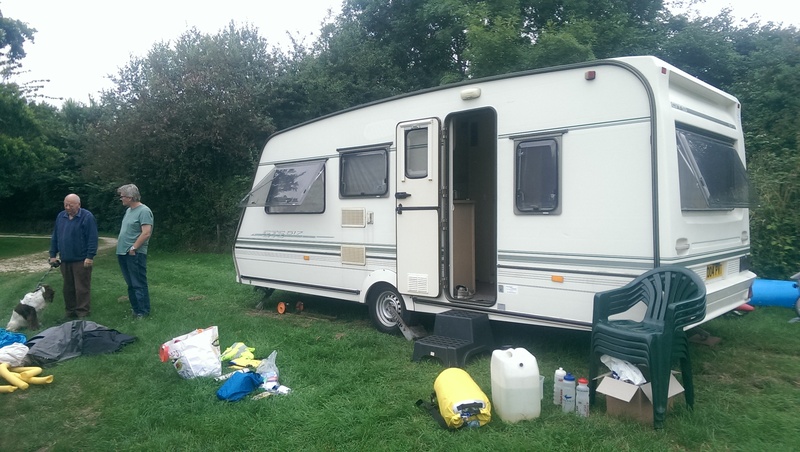 Valley Farm Campsite – Cumnor – For the small discount each night. 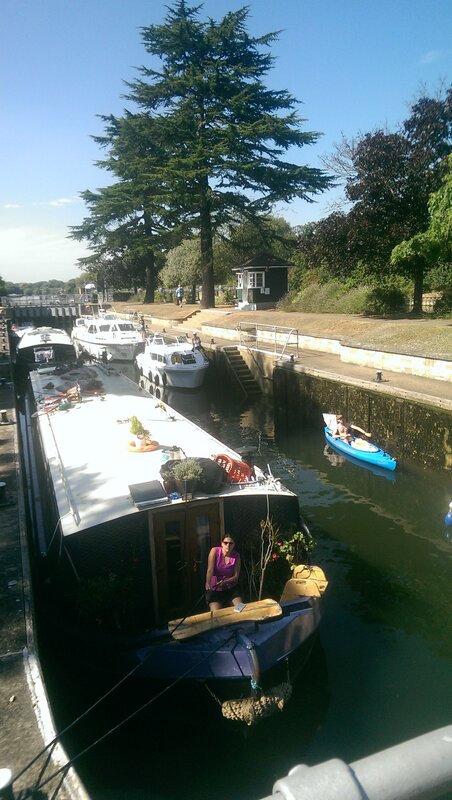 Hurley Riverside Park – Hurley – For a free night. 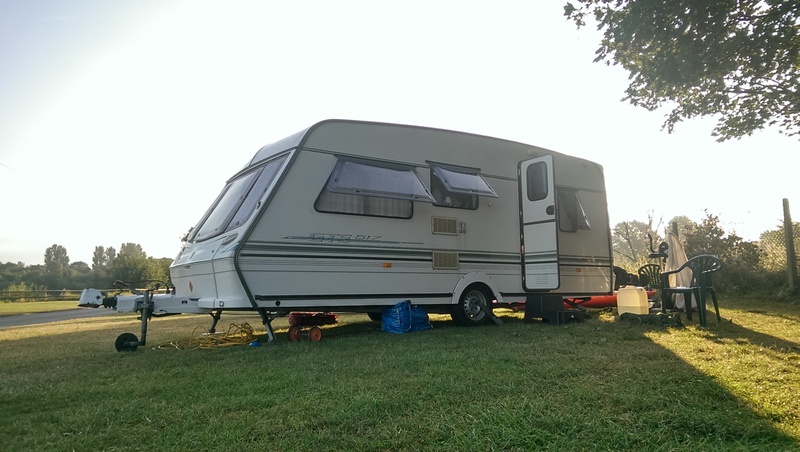 Amerdem Caravan Park – Maidenhead – For the large discount each night. 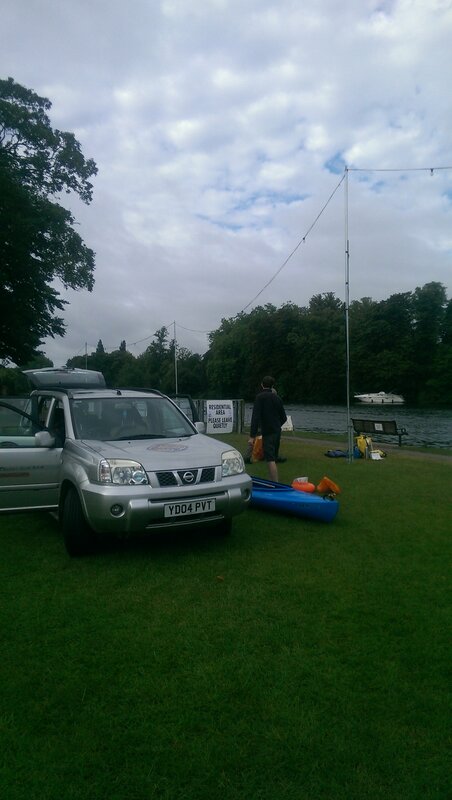 Thames Young Mariners – For letting us stay for free and at such short notice. Getting into Reading it started to rain like crazy. 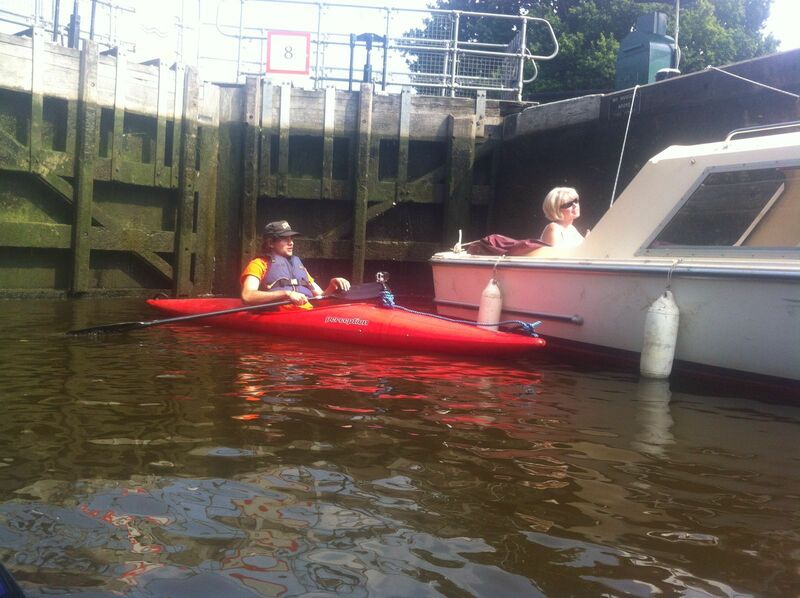 Kayaker Dave and Josh. Dave joined us for 4 – 5 days on the water, and was chief sign maker. 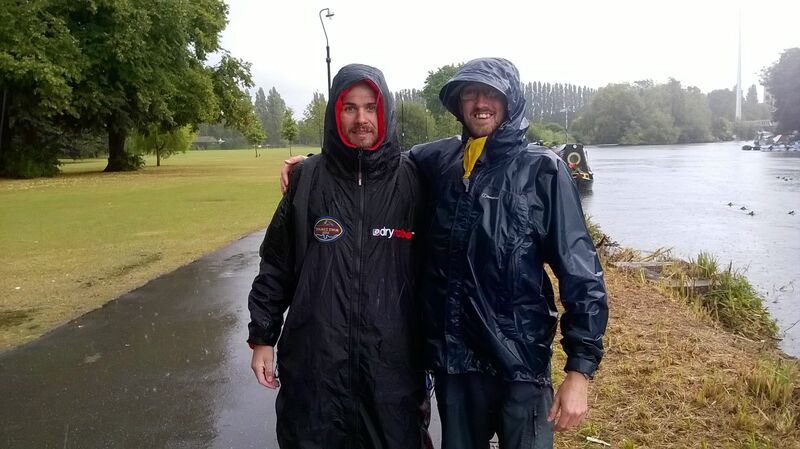 Rain wasn’t so bad for me, but Josh would get soaked! End of day 6. Synchronised swimming with Dave. Prepping for the day ahead. Flag mark 01.